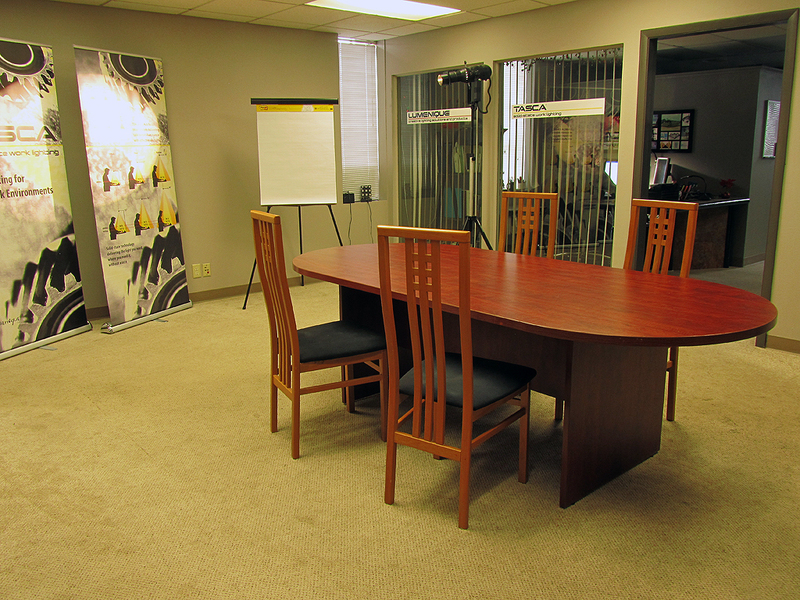 After a month of moving and settling in, we are now up and running in our new facilities. We’ve got room to move around, space to lay out projects, and our equipment is now properly set up, powered, and fully operational. This affords us to produce the level of quality we strive for, and opens doors for expanding capabilities. This is just the beginning of my personal effort to explore delivery of product and service of distinctive character and value. It also affords me the space to experiment, play, and create unrestrained by the cramped quarters we were operating out of in the home-based facilities. Believe it or not, most everything you see here in the tour was crammed into our home until the first week of November. It’s a work in process. As we add capabilities, as well as do a little lighting remodeling, I’ll post updates. Stop in and visit! 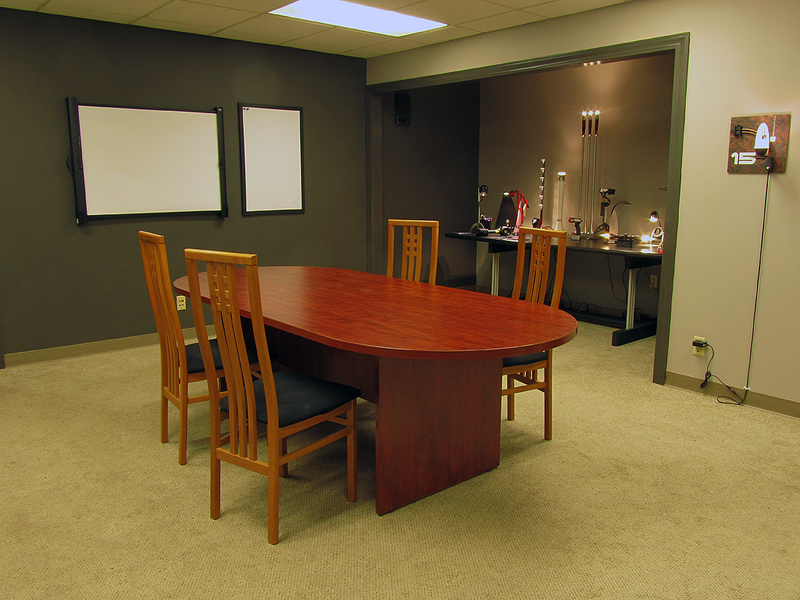 This is our conference/training/demo room. We’ll be offering small courses o SSL technology here, as well as using it to brainstorm customer solutions and demonstrate new ideas. The training room looking into Angie’s work space. She likes it dark with a lot of task lighting, something we are working on now. Yeah, its just a hallway. But it is also an exhibit space, and storage for small parts that need to live in a clean environment. To the left beyond the bookcase is a lounge for relaxing with video. The door in front of the bike is #5, which is the electronics area. 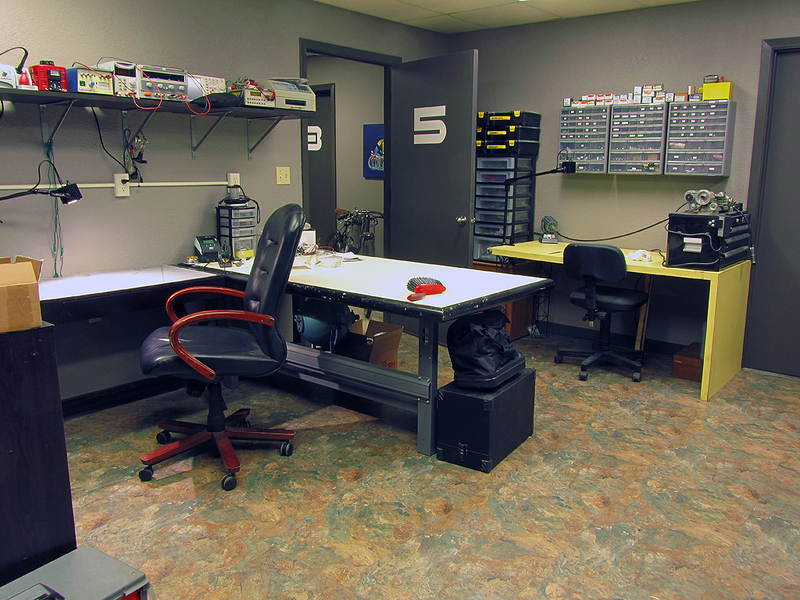 This is just a partial view of the electronics assembly and electrical test area. 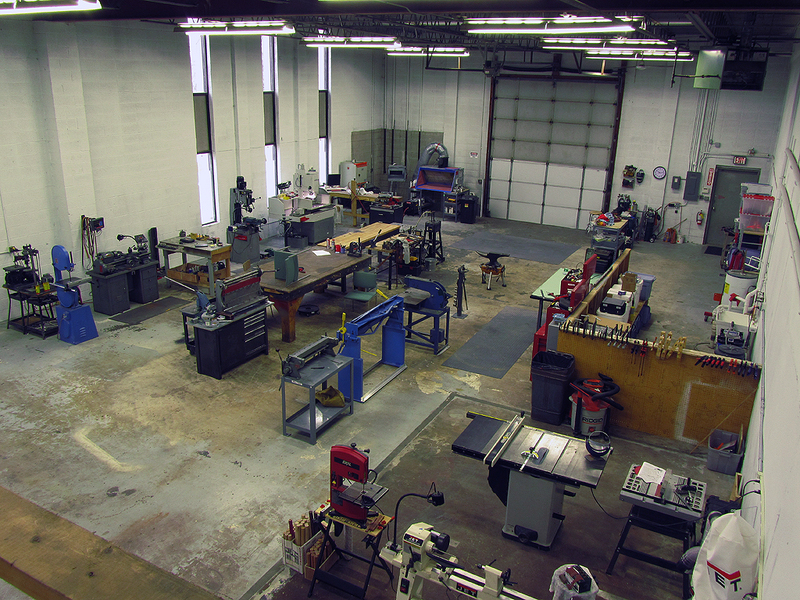 To the right (out of view) is our glass and plastics lab, while behind the camera is inventory of small parts and customer components. 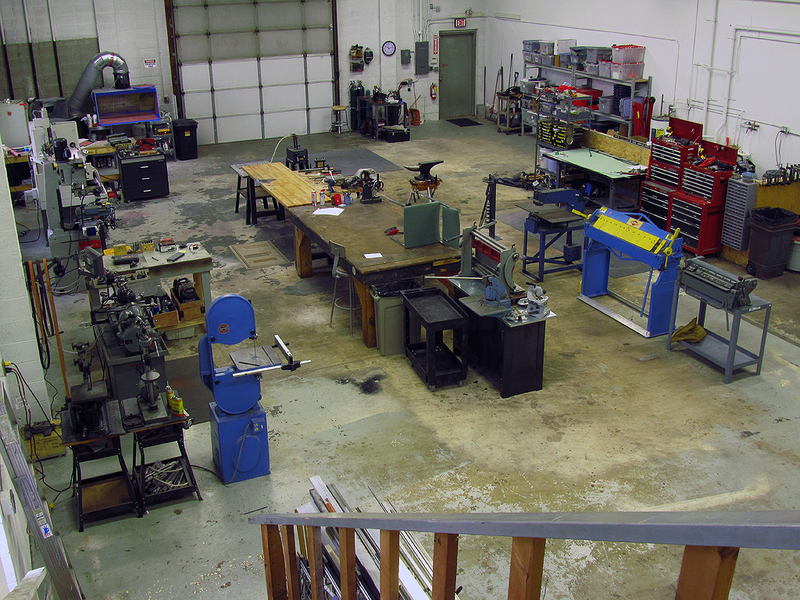 This view of the shop space shows the main space with sheet-metal fab in the center/right, working clockwise from the lathe to the left, mills, paint/powder coat, welding, tools with anodizing line behind, wood shop to the right, just out of the frame. We’ve intentionally left floor area open to facilitate large project mock-ups and assembly at the front and rear areas of the main floor space. From the opposite corner looking down, lower right is the wood working space, sheet metal in the middle again, lathe and mills beyond. The anodizing line is on the right center, and is being set up to run clear, black and red, with other colors added as we need them. This also shows the shop lights that are on the agenda for replacement with something less “classic”. Last shop view from floor level. This shows space we have left intentionally open for WIP materials and shipping/holding area. 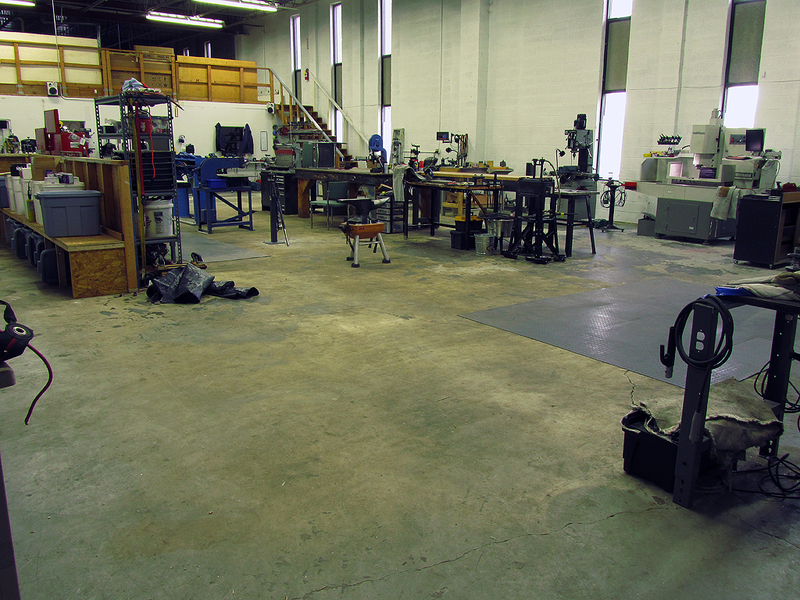 The rest of the space will likely fill up as we add more needed tools/equipment and racking for storing materials. So, that’s a few of the spaces we’ve set up for ourselves. There are other rooms, like our confidential customer storage space, and the plastics/glass working room, printer space and various storage rooms. It is all being tinkered with as we go, and is likely to evolve over time as we come to work in it more. The photometric test lab remains in its original location at home for now, just a few minutes away. It is all a massive improvement over having all of the equipment shown here jammed into half the space. We intend to make use of this to create all manner of new fun things heading into the new year. Hope to see you drop by and say hello! Kevin! CONGRATULATIONS!!! 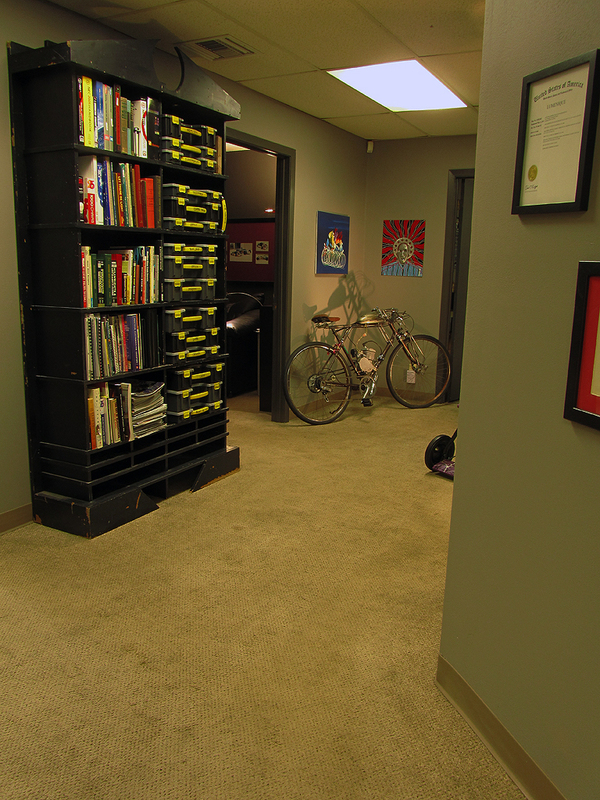 Your space looks great – thanks for sharing, and best wishes to you (and your wife!) I’m sure she’s glad to have her house back! Thanks. 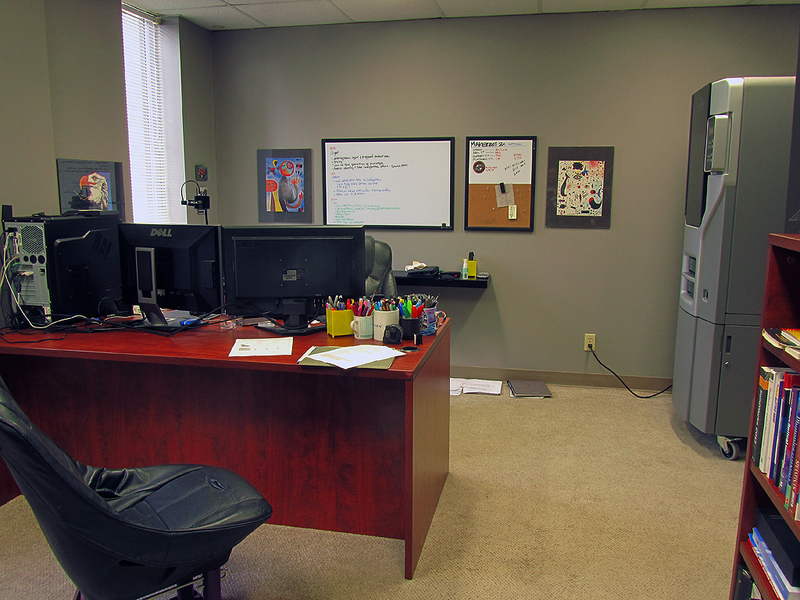 Actually, Angie is even happier to have a proper office and space to work as well. We’re building our future together with space to breath and explore – now with a home to return to at the end of the day, where we can unwind and relax without tripping over WIP.